A pioneering model of affordable, community led housing in Leeds, driven forward by Professor Paul Chatterton from the School of Geography, is inspiring community groups worldwide to build their own eco-homes. 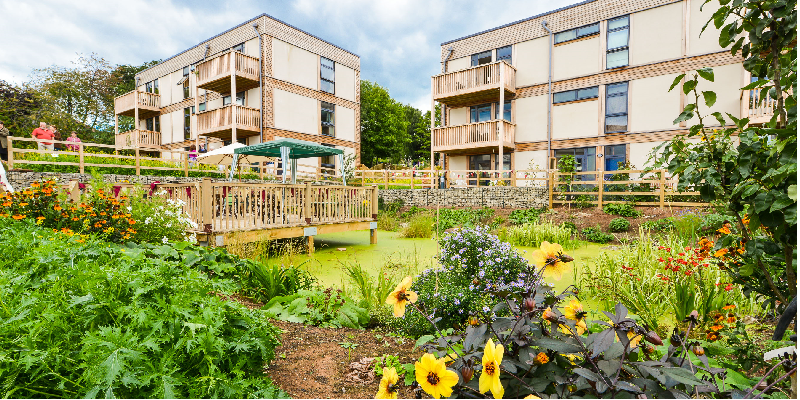 The LILAC (Low Impact Living Affordable Community) development in Bramley, Leeds which opened in 2013, made use of an old school site to build 20 dwellings (houses and flats) with a large common house, shared gardens and a community allotment. The aim is to reduce the environmental and economic impact of living and create a cooperative community. The buildings are constructed from ‘Modcell’ which are pre-made sections of timber frame, straw bales and lime render. They are airtight and super-insulated, with large, south-facing glazed panels to maximise sunlight and solar energy. While residents live in separate houses and flats, the heart of the community is the communal house where they organise weekly meals, hold meetings and house the shared facilities such as washing machines and gardening tools. The residents don’t hold individual mortgages but instead operate as a financial cooperative. Everyone contributes about 35% of their income towards the Mutual Home Ownership Scheme, which is a pioneering model of home ownership designed to keep homes affordable for people on average incomes and future generations. The influence of the project is reflected in the UK Government’s recent announcement of a new £170 million community led housing fund for which LILAC is the centre-stage example. Architects have also been enthusiastic advocates for the project and it was recently included in a UN report as an excellent example of the UN’s sustainable development goals in architectural practice. For Paul Chatterton, co-founder of LILAC, the project is an embodiment of “live action” research as the community has come together to develop its shared values and solve the practical issues of building and living together. His background in research on sustainable cities over the previous decade, has often included co-producing research with communities around issues of housing, energy and civic action. This led naturally to the idea of getting together with others to build their own houses, “it became live research” he said, with his role in the project of bringing many strands of community knowledge together. “The knowledge I had built up of 10 years on community finance and democracy just rolled out into the LILAC project” he explained. Through the project he has informed the academic debate on sustainable cities through papers and had a much wider influence with a book about the project. Although creating a sustainable housing movement was not the original aim, its impact has become worldwide, with the LILAC residents group now supporting UK and international networks of other communities developing similar projects in the US, Australia, Argentina and South Africa. Locally the success of the project has led to Leeds Community Homes, a cooperative, which aims to replicate community led housing projects around the Leeds City region. They have gained support and major funding from Power to Change and the National Lottery and have built 16 homes in the Leeds Climate Innovation district with more planned in the Armley area. ShangriLeeds cooperative is looking for a suitable site in the Leeds city region. In Chapeltown, the ChaCo group is progressing with financing and planning their co-housing development and an over 55’s co-housing cooperative is proposed for Abbey Mills in Kirkstall. Further afield, a group in Bray, Co. Wicklow, Ireland are replicating the LILAC project. Communal living is not without its challenges but the community has been prepared for these from the start, “It’s can be quite intense living in a community” explains Paul, “Because we are a financial cooperative, we stand and fall together, so we have to make an effort to get on. We are formally trained in making good decisions together and in non-violent communication, so the processes are there if people fall out”. As both a creator of the project and now a resident for the past 5 years, Paul Chatterton is enthusiastic about this way of living, “Having two young kids is really good and where it really flourishes for me, because their quality of life is so good, with friends on tap and lots of quality green space”, he said. The community seems to work well for all ages, with a real intergenerational mix and many over 55’s as well as young families. People tend to move up or downsize within the community, rather than move out, as their circumstances change. With estimates that the UK needs to build another 4 million homes and affordability increasingly an issue, new models of community led housing, like LILAC have a vital role to play in meeting demand. Paul Chatterton also sees that the community building ideas from LILAC could be introduced more widely. “The big potential over the next few years is to retrofit, as most of our housing stock is already here. Neighbours could come together to buy the middle house on a street as a communal space, take fences down to create communal gardens and move car parking to the end of the road. There are simple things that residents can do right now to change the way they live”.